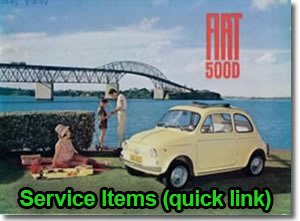 Motobambino - Classic Fiat 500 Parts & Spares panels, engines, engine parts, suspension parts, brakes, interior trim, chrome trim, glass, badge, cables, bushes, Gaskets, Fuel System, Transmission parts, Bearings and many more. 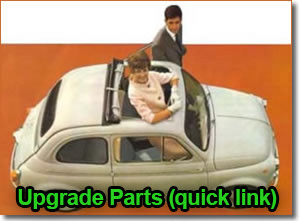 Motobambino is a specialist supplier of parts for the classic small Fiat range, specialising in the Fiat 500. We regularly compare prices offered by our competitors to make sure we are always competitive on price & offer a top quality service. So if you require a part for your Motobambino you’ve come to the right place!